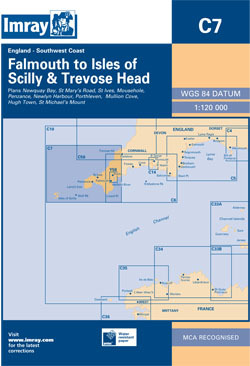 The south-west coast of England from Falmouth to trevose head, including the Scilly Is. Scale: 1 : 115.000. Minute gridlines. Larger scale plans of Penzance, Newlyn, Porthleven, St Ives, Mousehole, St Mary's, Portreath and Newquay Bay. Tidal stream diagrams. For this edition the chart has been fully updated using extensive new depth surveys throughout.